Barcelona will be aiming to stretch their lead atop the La Liga table to eight points when they travel to San Mames to take on Athletic Bilbao on Sunday. Four matches will be on show on Sunday, as Matchday 23 of the 2018-19 La Liga season continues. The final game on the day will be quite an intriguing one, as a somewhat resurgent Athletic Bilbao side plays hosts to defending champions Barcelona at San Mames. Athletic Bilbao, coming off one of their worst ever campaigns in a La Liga season in 2017-18, have been uncharacteristically poor this term as well. Currently sitting 13th on the table, Los Leones are just three points ahead of 18th placed Rayo Vallecano, and could find themselves engrossed in a relegation battle, although results have improved lately. Barcelona, on the other hand, have continued to remain perched on the summit of Spanish football for much of the season, even though they haven’t been as resounding in their performances this term. But, the defending La Liga champions have not been beaten in the league in nearly three months, although the 2-2 draw against Valencia last week did end a seven-match winning run. The reverse fixture, played at Camp Nou back in September, saw Barcelona come from behind to hold Athletic Bilbao to a 1-1 draw, courtesy a goal by Munir El Haddadi. Ahead of the latest meeting between the two sides, The Hard Tackle takes a closer look at the encounter. Gaizka Garitano only has a few pressing concerns hampering his preparations for the visit of Barcelona. On Sunday, the Athletic Bilbao boss will be without four first-team players due to suspension and injury troubles. Ander Capa is serving a one-match suspension due to accumulation of yellow cards, with Oscar de Marcos poised to replace him on the right side of the Athletic Bilbao defence. Meanwhile, Mikel Rico (ankle), Inigo Lekue (back) and Aritz Aduriz (knee) miss out due to their respective injuries. Garitano though, has enough cover in his squad to compensate for the absence of the trio. In Aduriz’s stead, Inaki Williams has led the line well for the Lions, and the 24-year-old should start as the focal point of the attack once again. Williams should have Iker Muniain, Inigo Cordoba and Ibai Gomez for company in attack, with Markel Susaeta being the backup option on the bench. Muniain, under Garitano, has been deployed in a more central role, which makes him a major threat against Barcelona. In the midfield pivot, Dani Garcia and Benat Etxebarria will provide a double cover to the backline, with the duo also looking to specifically target Lionel Messi. At the back, Oscar de Marcos will be accompanied by Inigo Martinez, Yeray Alvarez and Yuri Berchiche, while Iago Herrerin will man the Athletic Bilbao goal. Ernesto Valverde has been greeted with a mix of good and bad news heading into this weekend’s clash. Creative supremo Arthur is the major casualty from this week’s workload, with the Brazilian being sidelined for up to four weeks due to a hamstring complaint. In addition to Arthur, Rafinha (ACL rupture), Jasper Cillessen (calf) and Samuel Umtiti (knee) are also unavailable due to their respective injuries, although Umtiti has stepped up his recovery. The final player missing out this weekend is Jordi Alba, who is suspended for accumulation of yellow cards. Alba’s absence is another major area of concern, with the Spaniard likely to be replaced by Nelson Semedo on the left side of the Barcelona defence. Semedo’s makeshift position has been decided in part by Sergi Roberto’s struggles in the position against Valencia last weekend, with Roberto likely to start as the right-back. At the heart of the Barcelona defence, Gerard Pique and Clement Lenglet should continue their partnership, with Marc-Andre ter Stegen taking his place in goal. In Arthur’s stead, Arturo Vidal ought to start, although it will not be too surprising if Carles Alena is handed a start. 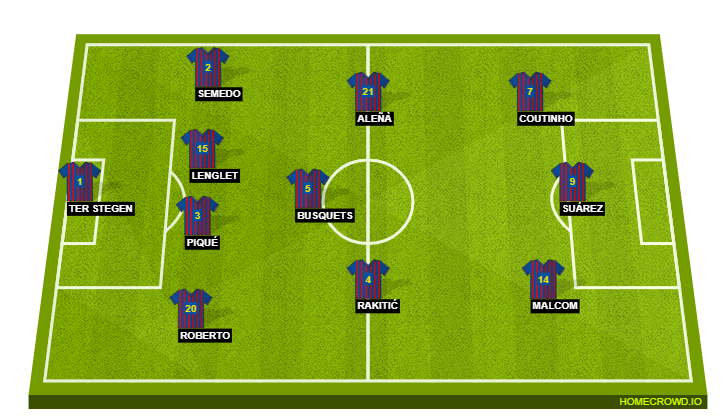 Sergio Busquets and Ivan Rakitic are certain starters in midfield. Meanwhile, the good news is that Ousmane Dembele has returned to full training and is part of Ernesto Valverde’s travelling squad. The Frenchman though, is likely to be eased into the starting lineup, and should be on the bench on Sunday. While Luis Suarez is automatic selections, Lionel Messi’s involvement is likely to be kept to a minimum once again, with Valverde not taking any chances with the club captain. The final two spots expected are thus, to be handed to Philippe Coutinho and Malcom, with the latter producing a positive performance against Real Madrid in the Copa del Rey this week. Barcelona have dominated their head-to-head battle with Athletic Bilbao for quite some time now, losing just one of the last 25 meetings between the two sides. 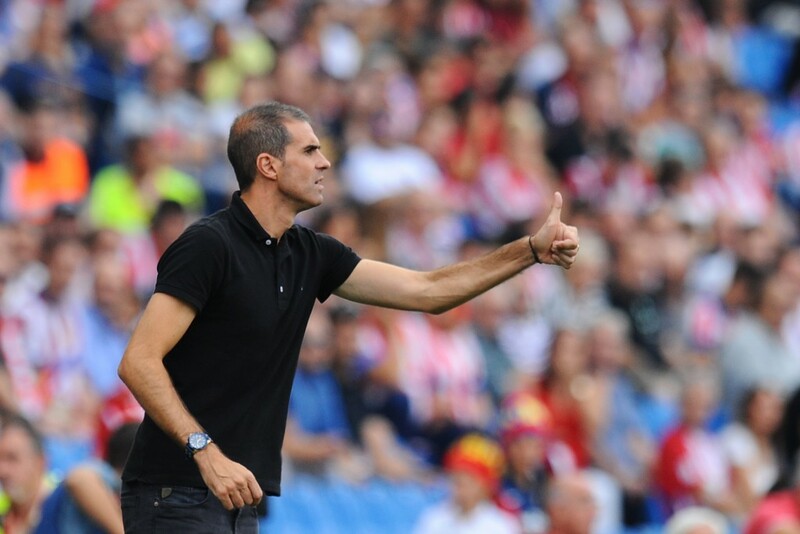 Athletic Bilbao have lost just once since Gaizka Garitano took charge, although that result came in their last match, against Basque rivals Real Sociedad. Barcelona boast by far the best away record in La Liga this season, having lose just once on their travels in 10 games so far (W7 D2). Athletic Bilbao have won only five of their 22 league games this season – the lowest of sides outside the relegation zone. Lionel Messi boasts an incredible record against Athletic Bilbao, having directly contributed to 34 goals in as many games against the Basque outfit. 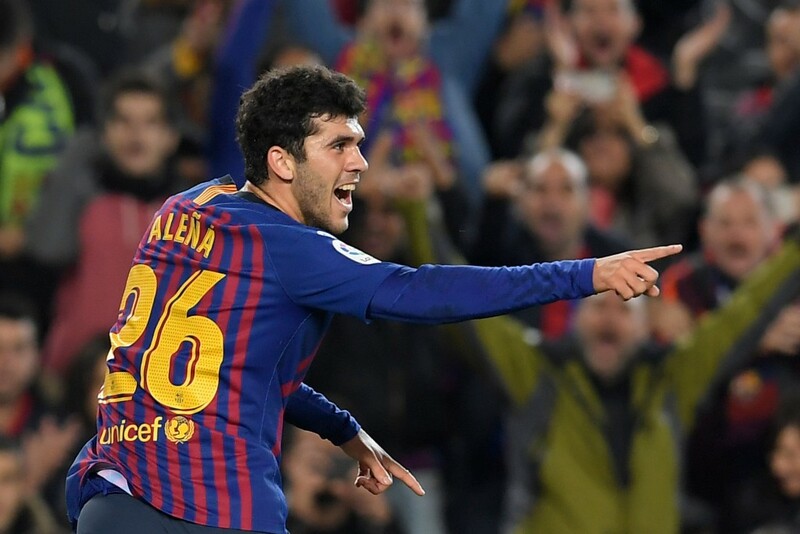 Whatever happens with Barcelona this season, 2018-19 will personally go down for Carles Alena as the campaign wherein he finally managed to break through into the first-team setup and fulfill a long-held promise. Growing with every passing performance, the absence of Arthur might have come as a blessing in disguise for the young Spaniard. Over the next month or so, game time is bound to increase for Alena, and starting with the game against Athletic Bilbao, he has the chance to show Ernesto Valverde why he needs to be given more game time. An important outing beckons for young Alena. Athletic Bilbao have visibly improved since the appointment of Gaizka Garitano, as most sides do under the tutelage of a new manager. But, in Barcelona, Los Leones will encounter a side that is harder to beat on the road than they are at Camp Nou, which in itself is quite a challenge. While the absence of Lionel Messi does give the hosts a sniff at getting a point for themselves, Barcelona are likely to be too strong for Gaizka Garitano’s men in the end. The Hard Tackle predicts a close contest, but one that should end with Ernesto Valverde & co. taking all three points, in a 2-1 win.